Question: We are considering this plan for Oklahoma so probably will use different materials on outside. Can this be incorported in the plans and specifications? 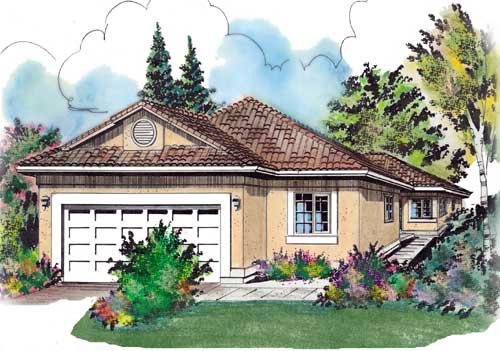 Additionally, does roof line extend from living area over the covered patio, as we would like to enclose this in glass windows so it could be heated and air conditioned. Interested also in zero threshold and wheelchair accessible doorways. Answer: Yes, the materials of your choice can be incorporated onto the set of plans. This can typically be done by your builder, however if you need it shown on the plans, this can be done as well. The roof line in the back does cover the patio to the column indicated on the floor plan. 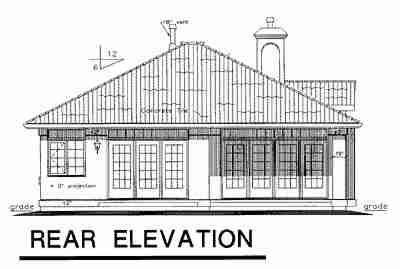 I have attached a rear elevation for your convenience. The patio can be enlarge to accommodate your needs.